Albert Einstein said time was an illusion. 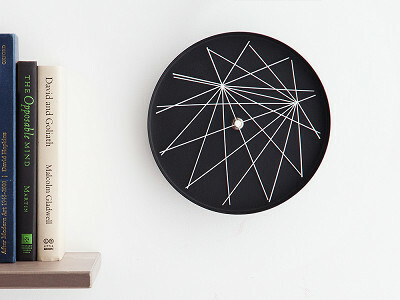 He would have loved the clocks from Studio Ve, which look at time in entirely new ways. Using changing shapes, geometric principles, and incredible imagination, Studio Ve’s avant-garde designs are captivating. Industrial designers Shay Carmont and Ben Klinger started with the 3-D Manifold clock, inspired by the Mathematical principles of Riemannian Manifolds. A single piece of flexible material forms the two “hands." It spins and folds on itself to create a sweeping motion that, like a spiral staircase, looks different depending on your angle of view. Their K clock creates constellation-like landscapes, with series of intersecting lines that literally look distinct every minute. Each Studio Ve design is a beautiful exploration of how to express time, and a mesmerizing way to simply watch it pass. 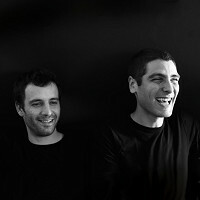 I’m Ben, the co-founder of Studio Ve, a product design studio. We’re fascinated by the concept of time and we create clocks with a unique fashion of time telling. Our clocks aren’t typical clocks. They are kinetic, mesmerizing objects. We are very excited to have our Manifold Clock featured on The Grommet. We feel it's the next step after successfully funding this venture on Kickstarter. I would love to hear from each and every one of you. Incredible! May I recommend a 2nd line that has a larger base, with slashes at each number. @Guest thank you for your input, it's nice to hear our audience's suggestions. Creating a visual of this concept of time is fascinating! You say that some people have found the clock hard to read - could you elaborate a bit more on this and how to easily interpret the movement? @Elaine hi, reading the clock is done with the standard minute and hour hand positions. This is made easier with the included wall stickers that can be placed to mark the hours. The long hand looks like a second hand in the video. Does this really work at a much slower pace, moving just slightly each minute? @Nancy hi, thank you for your interest. The long hand is the minute hand, and the video is sped up to allow viewers a varied look at the different appearances of the clock. Albert Einstein said time was an illusion. 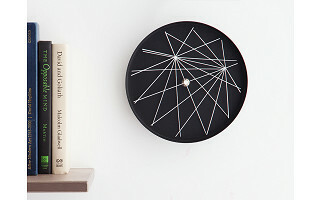 He would have loved the clocks from Studio Ve, which look at time in entirely new ways. Using changing shapes, geometric principles, and incredible imagination, Studio Ve’s avant-garde designs are captivating. Industrial designers Shay Carmont and Ben Klinger started with the 3-D Manifold clock, inspired by the Mathematical principles of Riemannian Manifolds. A single piece of flexible material forms the two “hands." It spins and folds on itself to create a sweeping motion that, like a spiral staircase, looks different depending on your angle of view. Their K clock creates constellation-like landscapes, with series of intersecting lines that literally look distinct every minute.